Used in later-model Bally/Williams games for mid-range power devices like slingshot bumpers, pop bumpers on some games, ball diverters, and more. Also replaces G.A.M.E. # W1268. Available with or without diode- select above when ordering (ships without diode by default). NOTE: Diode across solder lugs may be required when using this coil in some earlier electronic games. Order diode # 1N4004. FITMENT NOTE: This coil measures 1-9/16 inches long. It will not fit in some devices on early Bally solid-state games like replay knockers, etc., as it is about 1/16-inch too long. 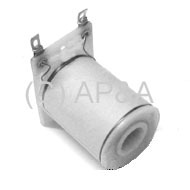 If the device you are installing this coil in will not accept a 1-9/16-inch coil, you will have to modify the device (bracket) to accommodate the longer coil.